Chinley Station can only be accessed via a steep metal bridge and pressure has been growing for better access. 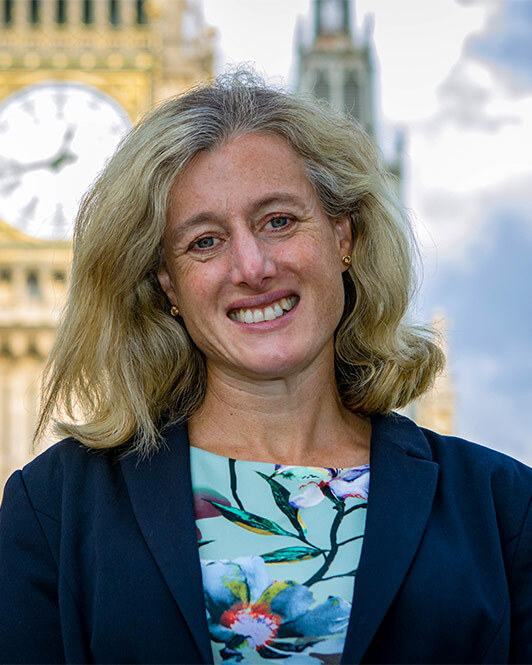 Earlier this year, Ruth George MP presented an 800 plus strong petition to the DfT organised by the Chinley & Buxworth Transport Group, and pressed the Transport Minister to meet with local campaigners. On Tuesday 19th June, Ruth George invited Miriam Walton and Paul Tattam of Chinley and Buxworth Transport Group, together with Chinley residents Katie Toft, the Paralympian cyclist, and Victoria Abbott-Fleming, a double amputee who campaigns across the country to raise awareness of Complex Regional Pain Syndrome, to meet Nusrat Ghani MP, Undersecretary of State for Rail Access. Katie and Victoria spelled out very clearly to the Minister what the difficult bridge and lack of level access to any part of Chinley station meant for themselves and their families, stressing that they were having to spend very high fees on taxis, or rely on family for lifts. Victoria and her husband Michael had had very bad experiences with Passenger Assist of being left on stations or charged for taxis from much further away. Paul and Miriam presented the results of the in-depth survey that had been run by the Transport Group and stressed the poor state of repair of the footbridge at Chinley, the importance to the community of an accessible railway station, the continuing growth in usage of the station and the ways in which an accessible railway can help alleviate congestion in the A6 corridor and car usage for visitors to the Peak District. 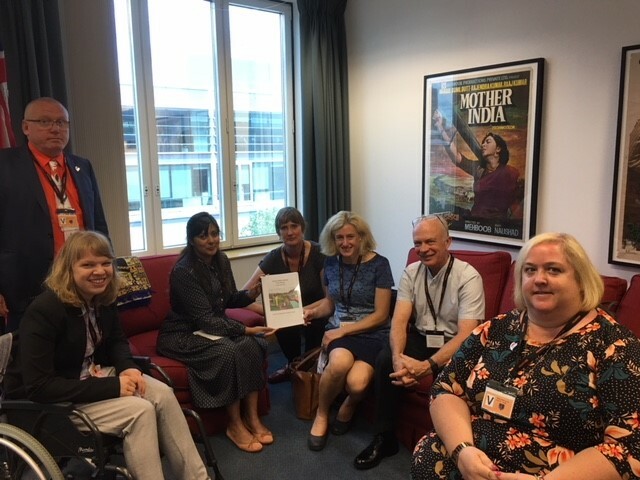 They also gave the Minister a dossier prepared by the severely disabled children of Peak School about what it would mean for them to be able to use Chinley Station for school trips. 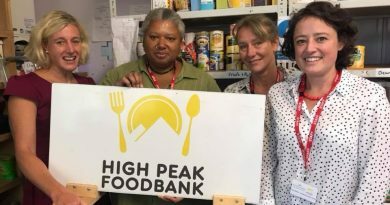 Ruth George MP stressed the strength of feeling of a wide range of local people and the need for Chinley Station to access health facilities in Sheffield and Manchester. Ruth said: “People with disabilities are entitled to access public transport and the state of Chinley station is not acceptable. 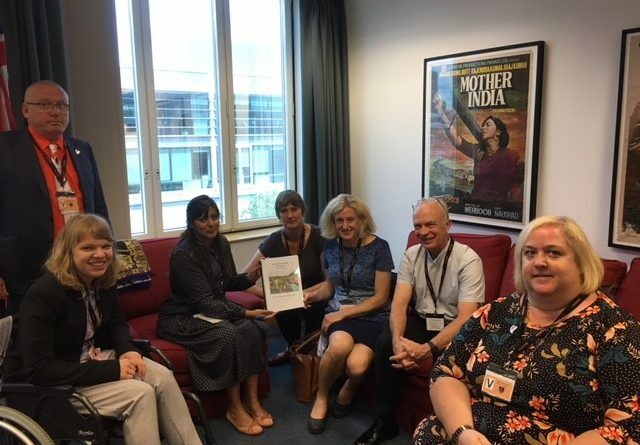 I was very pleased that the Minister agreed to meet with us and I give credit to the hard work of local campaigners on this issue over several years. I also thank Katie and Victoria and her husband Michael for joining us. It is not an easy journey for them to London, but their voices and personal experience of the station made our case much more powerful. Katie and Vicky shared with the Minister their experiences of using the station. Katie – the stairs are impossible to use. My parents take me to University as I am too tired to climb the stairs. If they couldn’t take me I wouldn’t be able to go to University. Access for all funding is essential for a town like Chinley which is growing fast with 1,000 new home being built in the catchment area of the station. Chinley has the 2nd biggest footfall on the Hope Valley line. Chinley has a Derbyshire County Council Excellence for Disability. The group have secured match funding for the project which gives then a strong case. Paul gave a pack put together by students from Peak School to the Minister about what they want from the station. The Minister had received the Group’s survey ahead of the meeting- which assessed the accessibility of the station for all ages – access was a problem at all ages. The next round of funding for ‘Access to All’ opens in the next few weeks and will be announced in the Spring. 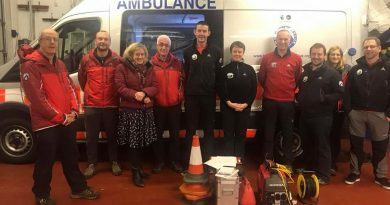 Ruth and Chinley and Buxworth Transport group to gather additional information based on the funding criteria to support a pitch to Northern for Access to All funds for the station.